Texas State University Does Exclusive Interview With OJ&B! 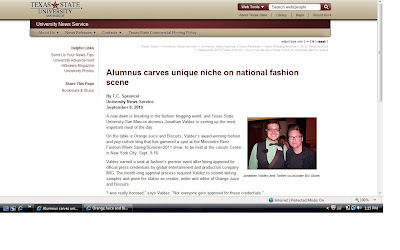 I am very honored that my Alma Mater, Texas State University-San Marcos, did a story about me and Orange Juice and Biscuits at Mercedes-Benz Fashion Week Spring/Summer 2011! You can read the article in its entirety below. Jonathan Valdez and Twitter co-founder Biz Stone. A new dawn is breaking in the fashion blogging world, and Texas State University-San Marcos alumnus Jonathan Valdez is serving up the most important meal of the day. On the table is Orange Juice and Biscuits, Valdez’s award-winning fashion and pop culture blog that has garnered a spot at the Mercedes-Benz Fashion Week Spring/Summer 2011 show, to be held at the Lincoln Center in New York City, Sept. 9-16. Valdez earned a seat at fashion’s premier event after being approved for official press credentials by global entertainment and production company IMG. The month-long approval process required Valdez to submit writing samples and prove his status as creator, writer and editor of Orange Juice and Biscuits. While at Texas State, the Bay City native co-hosted Orange Juice and Biscuits, a KTSW morning talk show that focused on fashion and pop culture. Encouraged by fans to continue after graduation, Valdez turned the hit show into a blog in August 2009, three months after completing his degree in communication studies. He has been hard at work, catering to a rapidly growing fan base and building a fashion journalism brand, ever since. “As far as the writing and content, I do all of that,” Valdez says, noting that his blog is equal parts work and passion. Valdez’s success — he was named a “Top 5 Best Blogger to Follow” for 2009 by Internet news site Mashable.com — represents a changing landscape in the world of fashion journalism. Traditional media institutions are increasingly giving way to new media journalists who, given the advantages of Web publishing, provide more specialized content at a much faster pace. This massive power shift has caused some turbulence in the industry. “Everybody has been really positive for me, and I’m going to continue to do my own thing,” he says. Judging by reader response, Valdez is doing a good job at doing his own thing, even as his profession is undergoing a complete transformation. At the dawn of a new day in fashion journalism, Jonathan Valdez is giving readers the juiciest scoop on the Web. Visit Jonathan Valdez’s blog at http://www.orangejuiceandbiscuits.com/. Special thanks to Texas State University-San Marcos and T.C. Sprencel for the extremely well written article. I am so pleased and impressed with how it turned out! 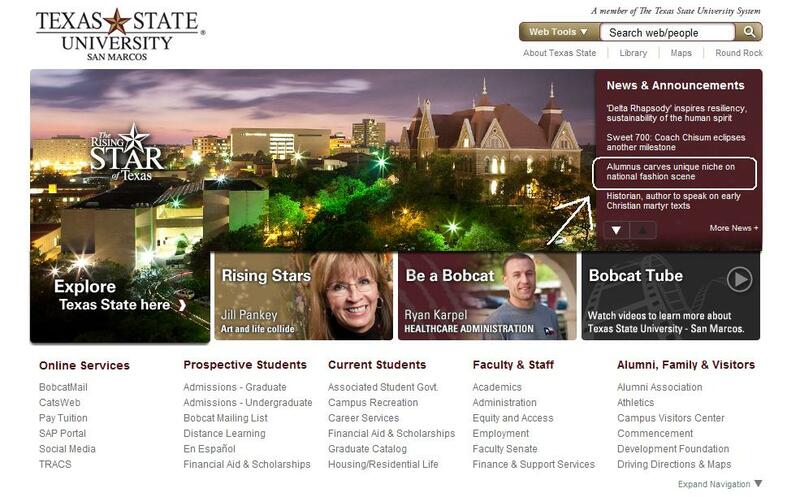 PLEASE check out the original post at Texas State's website by clicking here. While you are there check out everything the university has to offer as well as other great things that current students and Alumni are doing. 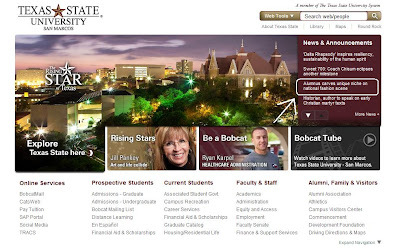 Above: The link to te article displayed on Texas State's home page under "News & Announcments." YAY! They interviewed me for this article. Congrats! THANKS MANDY!! LOVE YOU BOO! !